The FSN Forum held its first “live”event on the occasion of Human Rights Day, 10th of December 2010, inviting Romebased members and friends to a presentation and discussion with George Kent, Professor of Political Science at the University of Hawai’i and active member of the FSN Forum. The event was attended by over 70 participants from FAO and from outside. Mauricio Rosales, FSN Forum coordinator and member of the Right to Food Team, provided a brief overview on the Forum achievements and plans, including the High-Level online discussions that are being organized, thanks to the recently awarded FAO innovation fund. Professor Kent’s recent book, Ending Hunger Worldwide, tackles many aspects of the complex and scattered pieces of the global hunger puzzle. 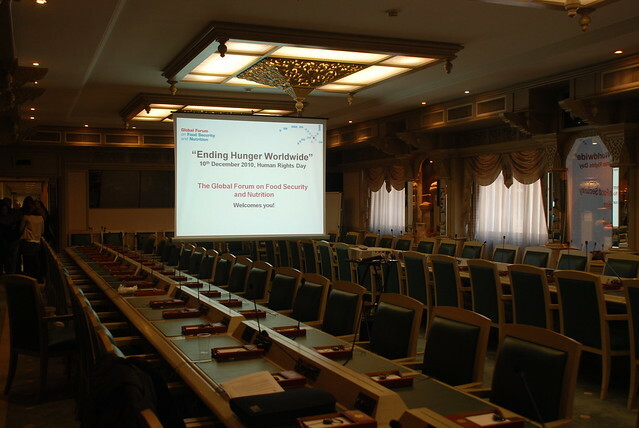 Kent presented the conflicting interests that keep undermining the global fight against hunger, pointed at the widening gaps in consumption trends between the rich and the poor, and the patterns of food trade flowing from food insecure to the rich countries. He also pointed out the weaknesses of national and global commitments to end hunger, and demonstrated the need for a different approach. He advocated the idea of solving the hunger problem from the ground up. Kent is concerned about the lack of a social dimension in most anti hunger policies. His principle observation is that in strong communities, in which people care about one another’s well being, people don’t go hungry. The proposal is a cellular approach, where efforts are focused on ensuring the health of every cell and every organ of the global body. It builds on the notion of self-reliance as opposed to self-sufficiency. Self-reliance emphasizes the community’s effective autonomy and local control over decision making on food policies. These ideas’ theoretical background goes back to Peter Kropotkin’s 1902 book, Mutual Aid. A concrete step in the direction of community self reliance is the creation of Nutrition Policy Councils. These entities can ensure joint planning by bringing together stakeholders from diverse food-related areas to examine how the food system is working and propose ways to improve it. They could be official advisory bodies to a city, county or state government or may be a grassroots network. Discussion with participants yielded reflections on FAO’s role and on the lack of planning at the global level in policies and commitments to fight hunger. Is it possible to sustain the notion of self reliance in a world pressured by big and influential players? How would it be possible to realize Kent’s approach with the many changes that are eroding and threatening the existence of many communities worldwide? Clearly there are conflicting and controversial views on the global hunger problem that need to be considered and addressed. As Kent pointed out, venues such as the FSN Forum are essential to provide the chance to dialogue and to come to grips with diverging and controversial points of view, spreading new ideas and approaches such as the Nutrition Policy Councils.